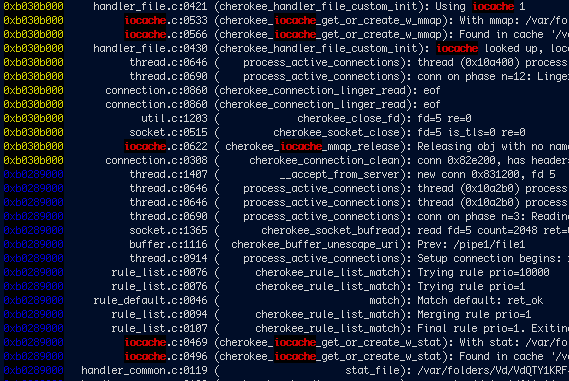 Cherokee Admin is written in Python. While making changes, you can use the -x or --debug parameter to see the Python back traces in the active console. If you need to debug the behavior of the web server (or an application), there are some helpful tools available for you. And then you’ll be able to execute gdb, cgdb, gdbtui.. This will let you trace the behavior with a human-readable output. Note that by enabling tracing you will be making Cherokee a lot slower. Keep this in mind when deploying in production environments. Restrict the tracing to the information generated by certain IP or Subnet. You can also access the functionality of CHEROKEE_TRACE through cherokee-tweak. Refer to the apropriate section of the documentation to learn more about this: cherokee-tweak. Lastly a utility is provided, contrib/tracelor.py, to provide further help to these tracing abilities. It is a little script that helps to read the tracing logs by colorizing the thread references and highlighting the words passed through the command line. And it would yield a colorized output. Even if it is not terribly complicated, it is a handy script to trace the server more easily.